TEL AVIV, Israel (AP) — Israel is using its world-leading expertise in cyber security to take on the growing threat of the global pro-Palestinian movement to boycott Israel. The Israeli government recently allotted nearly $26 million in this year’s budget to combat what it sees as worldwide efforts to “delegitimize” the Jewish state’s right to exist. Some of the funds are earmarked for Israeli tech companies, many of them headed by former military intelligence officers, for digital initiatives aimed at gathering intelligence on activist groups and countering their efforts. “I want to create a community of fighters,” said Sima Vaknin-Gil, the director general of Israel’s Ministry for Strategic Affairs and Public Diplomacy, to Israeli tech developers at a forum last month dedicated to the topic. Initiatives are largely being kept covert. Participants at the invite-only forum, held on the sidelines of a cyber technology conference, repeatedly stood up to remind people that journalists were in the room. Among the government officials involved in the efforts are some of Israel’s top secret-keepers, including Sima Shine, a former top official in the Mossad spy agency, and Vaknin-Gil, who recently retired as the chief military censor responsible for gag orders on state secrets. Israel has established itself as a world leader in cyber technology innovation, fueled by graduates of prestigious and secretive military and security intelligence units. These units are widely thought to be behind some of the world’s most advanced cyber-attacks, including the Stuxnet virus that attacked Iran’s nuclear energy equipment last decade. Each year, these units churn out a talent pool of Israelis who translate their skills to the corporate world. Now Israel is looking to harness their technological prowess for the fight to protect Israel’s international image. Vaknin-Gil said her ministry is encouraging initiatives to expose the funding and curb the activities of anti-Israel activists, as well as campaigns to “flood the Internet” with content that puts a positive face on Israel. She said some of these actions will not be publicly identified with the government, but that the ministry will not fund unethical or illegal digital initiatives. Established about 10 years ago, the pro-Palestinian “BDS” campaign is a coalition of organizations that advocate boycotts, divestment and sanctions against Israel. Inspired by the anti-apartheid movement, BDS organizers say they are using nonviolent means to promote the Palestinian struggle for independence. The movement has grown into a global network of thousands of volunteers, from campus activists to church groups to liberal Jews disillusioned by Israeli policies. They lobby corporations, artists and academic institutions to sever ties with Israel. The movement has made inroads. U.S. and British academic unions have endorsed boycotts, student governments at universities have made divestment proposals, and some famous musicians have refused to perform in Israel. 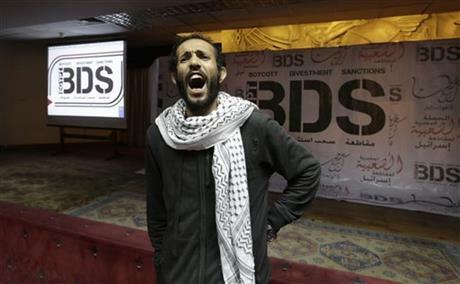 The BDS movement also claims responsibility for pressuring some large companies to stop or modify operations in Israel. In its latest push, it has urged top Hollywood actors to reject a government-paid trip to Israel being offered to leading Oscar nominees. Omar Barghouti, co-founder of the BDS movement, said “quite a few web pages” that BDS websites linked to have mysteriously disappeared from the Internet. “We assume Israel’s cyber sabotage is ongoing, but we are quite pleased that its detrimental impact on the global BDS movement has been dismal so far,” he said. Many online activists driving anti-Israeli campaigns on social media are tech-savvy, second- and third-generation Muslims in Europe and the U.S. who have grievances against the West and also lead online campaigns against European and U.S. governments, said Elad Ratson, who tracks the issue for Israel’s Foreign Ministry and spoke at last month’s cybersecurity forum. He said they often create code that allows activists to blast thousands of messages from social media accounts — creating the illusion that many protesters are sharing the same anti-Israel or anti-West message online. Israeli officials lobby Facebook to remove pages it says incite violence against Israelis, and there has been talk of advancing legislation to restrict Facebook in Israel. A Facebook representative met with Strategic Affairs Minister Gilad Erdan in Israel last week about the matter. Ratson said social media giants are beginning to close inciting users’ accounts. Twitter said in a statement this month that since mid-2015, it has closed more than 125,000 accounts that were “threatening or promoting terrorist acts, primarily related to ISIS,” the Islamic State group. But he said Islamist activists are simply moving to “Darknet” sites not visible on the open internet. Some Israeli tech companies are starting to build sly algorithms to restrict these online activists’ circle of influence on the “Darknet,” so activists think their message is reaching others when in fact it is being contained, Ratson said. Other Israeli companies work on forensic intelligence gathering, such as detecting digital or semantic signatures buried in activists’ coding so they are able to track and restrict their online activity. Firewall Israel, a non-profit initiative sponsored by the Reut Institute, an Israeli think tank, is building an online platform to help pro-Israel activists around the world communicate about anti-Israel activism in their communities. At a recent event the initiative held at Campus Tel Aviv, a Google-sponsored event space for entrepreneurs, an Israeli web expert taught young activists how to mine the internet for BDS activities. Inspiration, an Israeli intelligence analysis company founded by Ronen Cohen and Haim Pinto, former military intelligence officers, launched a technological initiative some months ago to collect intelligence on BDS organizations in Europe, particularly Scandinavian countries, the U.S., and South America, Cohen said. He said the initiative aims to dismantle the infrastructure of groups he said were responsible for incitement and anti-Semitism against Israel. He declined to give specifics. Their political leadership was also widely admired. The kind of people who would resist the pressure to pin up posters of Hafez or Bashaar al-Assad might still raise Hassan Nasrallah’s picture. During the 2006 war, very many Syrians of all backgrounds donated money to the refugees and to Hizbullah itself. The famous actress Mai Skaf was one such benefactor. Which brings us to the second moment for comparison: summer 2013. Throughout May, hundreds of Hizbullah fighters led a devastating assault on Qusayr. Because they were local men defending their homes, the Free Syrian Army were able to resist the onslaught for weeks, but were finally defeated. A Shia flag was then hung over the town’s main Sunni mosque, a signal of sectarian conquest. Shortly afterwards the regime burnt the Homs Land Registry, and Alawi and Shia families were invited to occupy homes abandoned by the families of Qusayr. So a militia designed to resist foreign occupation became an occupier itself. The supposed assistant of the oppressed became the fighting arm of the oppressor. In Shia symbology, Hizbullah, rather than defending Hussain, was serving Yazeed. The backlash hit fast. Qusayr fell on June 5th. On June 11th 60 Shia, most civilians, were massacred at Hatla in Deir al-Zor. Why did Hizbullah intervene against the Syrian revolution? Various excuses were offered up: to protect the Lebanese borders, or to protect the shrine of the Prophet’s grandaughter Zainab outside Damascus. None of them explained Hizbullah’s participation in battles as far afield as Hama or Aleppo. Why would Nasrallah choose to infuriate Lebanese Sunnis, to make Lebanese Shia targets of sectarian revenge attacks, to deplete and downgrade his anti-Zionist fighting force? Iranian counter-revolutionary policy not only uses Arab Shia as cannon fodder, but bears huge responsibilty too for the anti-Shia backlash on the Syrian battlefield and in regional public opinion. The Iranian state, therefore, is not a protector of Arab Shia but a threat to their security and wellbeing. Likewise in Iraq, where before the 2003 invasion and occupation a third of marriages were cross-sect Sunni Shia. Today, after the civil war’s ethnic cleansing, and with ISIS facing not a unified Iraqi army but a collection of Iran-backed Shia militias, it’s hard to see how the country’s sectarian relations can ever be healed. The Iranian state’s undue influence on Iraq’s military and political life has helped strangle both communal coexistence and the possibility of democracy. And Iranian officials openly boast their imperialism. “Three Arab capitals have today ended up in the hands of Iran and belong to the Islamic Iranian revolution,” Ali Reza Zakani, an MP close to Supreme Guide Ali Khamenei, said last year (he was referring to Beirut, Damascus and Baghdad). Of course, more players than just Iran are responsible for Iraq’s dysfunction. The United States must be blamed for the occupation, and the Saddam Hussain regime which fanned sectarianism to divide and rule, specifically to put down the 1991 southern uprising. Sectarian TV channels from the Gulf don’t help. And historically, the British and French states did their fair share of damage (and sectarian engineering) during the post-Ottoman carve-up. None of these states protected people. And this is because they are states. The young man who spoke up for Iran wasn’t a Shia Muslim. He was a Catholic, he said, who’d grown up in the Gulf. And he was also a leftist. But this is something that leftists, when they were internationalists, once understood: states are designed to protect the property, position and privilege of the various elites which run them, not to safeguard the interests of ordinary people. This means Iran is not the protector of the Shia, Saudi Arabia is not the protector of the Sunnis, and Israel is not the protector of the Jews. Need it be said that the Assad regime is the deadliest enemy of Alawis? “He shouldn’t die for practicing his profession,” journalist and administrative detainee Mohammed Al-Qeeq’s brother tells MintPress News as protests worldwide demand his release. NEW YORK — As Palestinian journalist Mohammed al-Qeeq reaches the 70th day of a hunger strike against his administrative detention by Israel on Tuesday, protests demanding his freedom are growing across the world as others continue in Palestine. Supporters overseas echoed the family’s alarm. “Al-Qeeq is facing imminent death at the hands of his occupiers,” Lisa Gagliardo, president of Students for Justice in Palestine at St. Joseph’s College in Brooklyn, told MintPress after a demonstration for al-Qeeq in New York on Friday. Other protests for the 33-year-old father of two took place in Berlin and London, as well as various parts of Palestine, the same day. “The police had tipped the BBC off about our protest, so they had cordoned the whole area off with fencing and private security,” Innovative Minds founder Abbas Ali told MintPress about the London group’s protest outside the British state broadcaster’s headquarters. 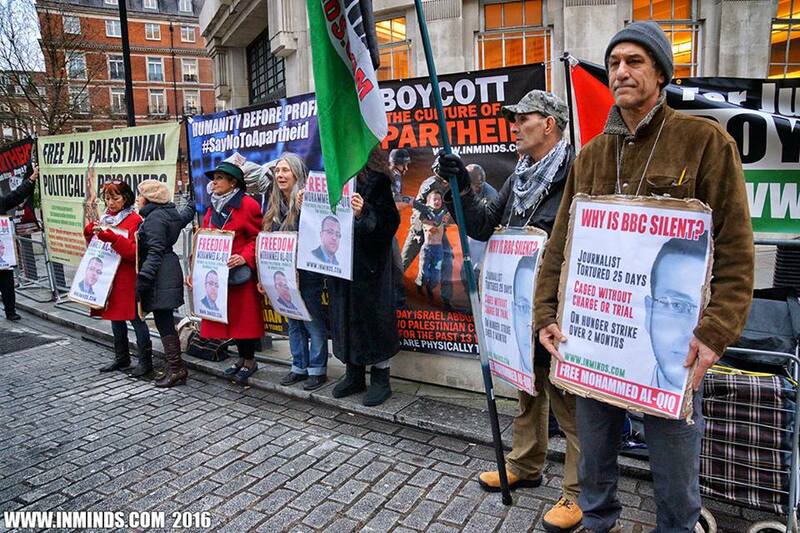 Innovative Minds, which organizes regular protests to support Palestinian prisoners, held this one at the BBC because it had not reported on al-Qeeq’s hunger strike, Ali added. “If it was anywhere else in the world that a journalist was tortured for 25 consecutive days for his reporting, on hunger strike for 66 days, lapsing in and out of consciousness with organs about to fail, making his last will and testament, about to die, the BBC would surely have reported it,” he said. 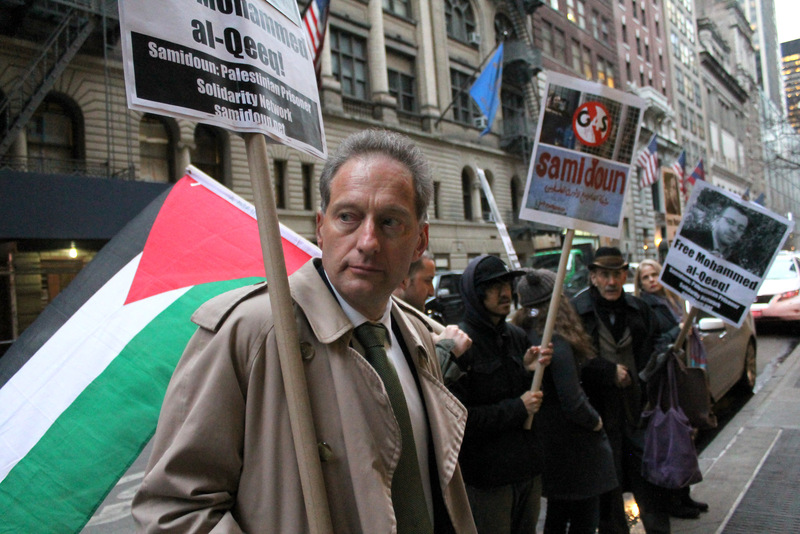 The New York protest, part of a series organized by Samidoun: Palestinian Prisoner Solidarity Network and the group’s second local demonstration for al-Qeeq, took place outside the Manhattan office of British-Danish security conglomerate G4S. G4S, the world’s biggest security firm and its second-largest private employer, holds contracts to equip Israeli prisons and detention centers, as well as checkpoints, military and security forces. The company has been targeted for boycotts by the Palestinian Boycott, Divestment and Sanctions (BDS) National Committee and other civil society groups, as well as the National Palestinian Prisoners’ Movement, a coalition of prison organizations representing current detainees. G4S “provides the security systems and the control rooms not only for the prisons which hold nearly 7,000 Palestinians, but also for the detention and interrogation centers where people like Mohammed al-Qeeq are tortured,” Beirut-based Samidoun international coordinator Chartotte Kates told MintPress. 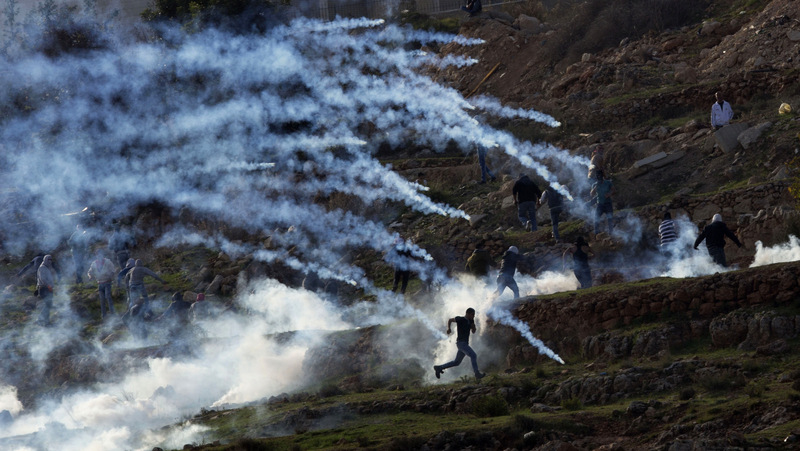 Protests inside historic Palestine ranged from Gaza City, to HaEmek Medical Center in Afula, where al-Qeeq is currently held, to Jerusalem’s al-Aqsa Mosque, to Bil’in, where Israeli soldiers attacked a weekly protestdedicated to al-Qeeq with tear gas. “Many activities have been held in Gaza, the West Bank, the ’48 territories, and outside Palestine to shed light on his case,” Basem Naim, a former minister of health in the Gaza-based Palestinian government, told MintPress. Demonstrations supporting al-Qeeq continue daily across Palestine, he said. The administrative detention law used to imprison al-Qeeq allows British military commanders to order the incarceration of Palestinians from the Occupied West Bank, as well as inside the internationally-recognized borders of Israel, without charge or trial. The measure, which commanders can renew unlimited times to keep detainees jailed indefinitely, has drawn rising criticism as al-Qeeq’s hunger strike continues. These calls for a legal process to resolve al-Qeeq’s hunger strike, and the administrative detentions of around 660 other Palestinians, fall short, supporters say. 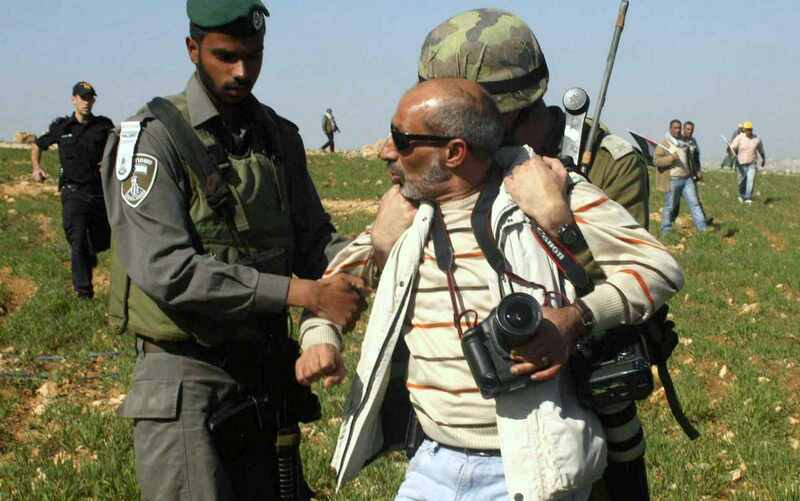 Sa’adat, a prominent Palestinian prisoner and the general secretary of the Popular Front for the Liberation of Palestinian, was captured by Israeli forces in 2006. In 2008, a military court sentenced him to 30 years’ imprisonment on charges of leading an organization banned by occupation regulations. The International Committee of the Red Cross declined to even call for a trial, instead releasing a statement on Jan. 21 “urging both the detaining authority and the detainee to find a solution” without mentioning al-Qeeq by name. This call, which cited the ICRC’s status “as a neutral organization,” drew harsh criticism. Despite warnings of al-Qeeq’s increasingly dire conditions, Israel’s Supreme Court ruled against an appeal for his release on Wednesday. A report issued Saturday by HaEmek Medical Center confirmed al-Qeeq’s grave condition. In a statement released through the Palestinian Authority’s Committee for Prisoners’ Affairs from his hospital bed earlier Saturday, al-Qeeq said Israel had targeted him because of his reporting. His family and other supporters agreed. 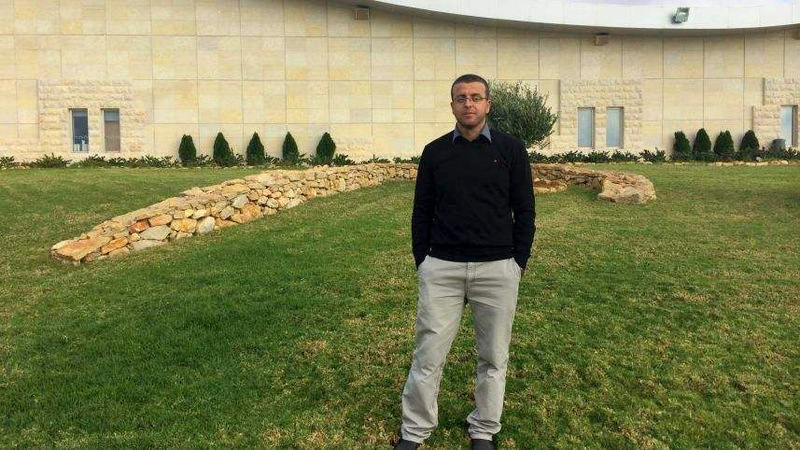 Barakat added that Mohammed al-Qeeq was one of many Palestinian reporters detained by Israel. Al-Qeeq added that he was determined to persevere until his death or release. Further international protests are planned this Friday in Berlin and New York, and on Saturday in Montreal, with announcements of others expected soon. His supporters abroad hope their efforts for al-Qeeq will increase overall pressure on Israel, even after his hunger strike. “When we highlight Israel’s brutality at an individual level, it motivates people to condemn it in higher numbers,” Lisa Gagliardo, of the St. Joseph’s’s College chapter of Students for Justice in Palestine, said. Feb. 10 2016, 7:56 p.m.
Two million human beings, some of whom worked here for years, some of them even have friends here, live in abject poverty and petrifying despair, mainly because of Israel’s blockade. The latest news from the ghetto comes, as usual, from the outside. The addiction to fear and the eternal wallowing in terror in Israel suddenly reminded one of the existence of the neighboring ghetto. Only thus are we here reminded of Gaza. When it shoots, or at least digs. Residents of the communities surrounding Gaza hear sounds, perhaps the sounds of digging, and the ghetto is no longer abandoned. We recall its existence. Iran dropped off the agenda. Sweden isn’t scary enough. Hezbollah is busy. So we return to Gaza. If the Ayelet Zurer affair loses steam heaven forbid, or the Moshe Ivgy affair doesn’t take off – the things that are really interesting – because then some bored commentators and editors and politicians and bloodthirsty generals are liable to drag Israel into another “war” in Gaza. And “war” in Gaza is always another controlled massacre, whose achievements are measured in the number of corpses and amount of destroyed buildings that it leaves behind. Isaac Herzog has already promised as much. But the real news from Gaza doesn’t reach Israelis. Who here heard that jets of the most moral air force in the world poisoned in recent weeks the fields of a “buffer zone,” which Israel declared unilaterally, at a distance of 300 meters from the fence? Farmers in Gaza report that the dusters spread the poison up to 500 meters, and that 1,187 dunams (293 acres) were damaged in the last poisoning in December. The pilots, convinced that they are doing a good thing, reported hitting their targets accurately. Pay attention to the sterile wording of the IDF spokesman: “Aerial spraying of herbicidal germination preventing material next to the security fence was carried out in order to allow optimal implementation of ongoing security missions in the area,” he stated. Fishermen are forbidden from venturing more than six nautical miles out from shore. Sometimes they catch a fisherman or shoot him. Farmers are forbidden from going within 300 meters. Everything is done to serve Israel’s security, and its security alone – and the occupation of the Gaza Strip ended a long time ago. Just an hour’s drive from Tel Aviv, there is a ghetto. Even without supplying “germination preventing materials,” almost nothing grows in it. Up-to-date data from Gisha-Legal Center for Freedom of Movement indicate 43 percent unemployment, 70 percent in need of humanitarian assistance and 57 percent suffering from nutrition insecurity. And then there is the spine-chilling report that the United Nations Relief and Works Agency issued in August under the headline “Gaza 2020: A livable place?” By then the damage to the water infrastructure will be irreversible. The water today is already not potable. The GDP per capita, $1,273, is less than it was 25 years ago, perhaps the only one that declined. Another 1,000 doctors and 2,000 nurses will be needed in the besieged, collapsing health system. From where will they come, out the faculty of medicine in Nuseirat or from the students who left to study medicine at Harvard? Egypt tightened its grasp, the world shirked its commitments and Israel exploits this to continue the blockade. They get three hours of electricity, sometimes six, in the cold and rain. After that, there is no electricity for 12 hours, and then again for three or six hours, day in, day out. There are about two million people, a million of them refugees and their families, made refugees directly or indirectly by Israel. About a million of them are children. No Israeli can imagine it. Few Israelis feel guilty about it. There are few Israelis who care at all. Hamas, you know. When the next catastrophe in the world hits, be it an earthquake or flood, we’ll be there with a delegation from the Israel Defense Forces, the same IDF in the same fatigues in which they spray the fields in Gaza. We are always the first. And meanwhile in the ghetto, two million human beings, some of whom worked here for years, some of them even have friends here, live in abject poverty and petrifying despair, mainly because of Israel’s blockade. The “We left Gaza” operation is complete. Now we only need to wait for the tunnels to start bombing again.